The Vietnamese leader was the keynote speaker of the discussion on sustainable development, climate change, and energy. He stressed Vietnam is one of the countries to be most vulnerable to climate change and negative impacts of unsustainable exploitation of water resources of the Mekong River. He reaffirmed the country’s commitment to early achievement of the 17 Sustainable Development Goals of the United Nations, adding that the priorities would be reducing poverty, addressing inequality, improving education, promoting renewable energy and coping with climate change. “Vietnam has been continuing to integrate climate change preparedness into its development planning, and is fully committed to reducing greenhouse gas emissions by 8 percent by 2030, and even upwards of 25 percent if the country receives necessary support from the international community,” he said. As the host of the Asia-Pacific Economic Cooperation (APEC) 2017, Vietnam has pushed the agenda for sustainable development, climate change response and efficient energy use. It is cooperating with APEC member economies to promote inclusive development, he noted. 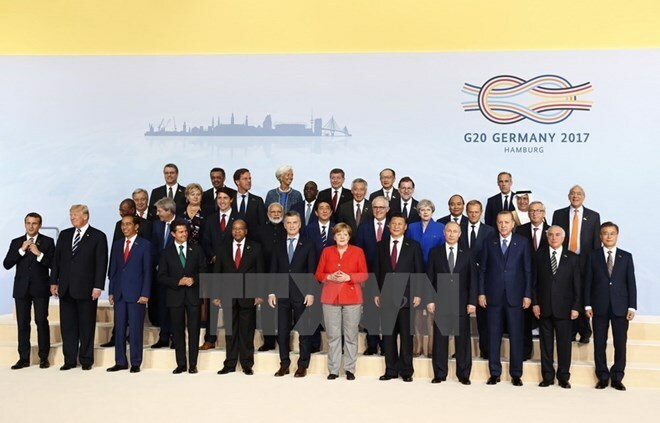 The PM applauded G20 for its unanimous commitment to responsible and efficient management and use of water resources. He also asked G20 members and the international community at large for more financial and technological support to developing countries in achieving the SDGs. Vietnam is participating in the G20 Summit as the host of APEC 2017. This is the third time it has taken part in a G20 Summit. In 2010, it was present at the summits in Canada and the Republic of Korea as the chair of ASEAN. The 2017 G20 Summit in Hamburg draws leaders of the G20 members and the guest countries of Vietnam, Singapore, Spain, Norway, Guinea (the chair of the African Union), and Senegal (the chair of the New Partnership for Africa’s Development). It is also attended by leaders of leading international organisations such as the UN, the International Monetary Fund (IMF), the World Bank (WB), the Organisation for Economic Co-operation and Development (OECD), the International Labour Organisation (ILO), the World Trade Organisation (WTO), and the World Health Organisation (WHO). Themed “Shaping an interconnected world”, the summit discussed an array of important issues of global economy such as growth, trade, investment, international finance, sustainable development, climate change, energy, support to Africa, migration, health care, employment, digitalisation, and women.